Hotel Gran Claustre, Restaurant & Spa: a unique boutique hotel on the Costa Dorada. The Hotel Gran Claustre is one of the most unique and exclusive hotels on the Costa Dorada. It is located in the old quarter of the mediaeval village of Altafulla in the Tarragona province, 1km away from the beach and 15km away from the city of Tarragona. It is considered a monument hotel as one of its buildings dates back to the 18th century, and it has been declared a cultural asset of national interest. The Hotel Gran Claustre is a charming hotel, offering the perfect combination of traditional structure and modern decoration. It has 39 rooms, everyone different from the rest and distributed over two buildings. Its gastronomic restaurant, Bruixes de Burriac by Jaume Drudis, is the perfect way for you to enjoy local cooking while enjoying a short break or holiday on the Costa Dorada. The Hotel Gran Claustre also invites you to relax and treat yourself in its welcoming spa. 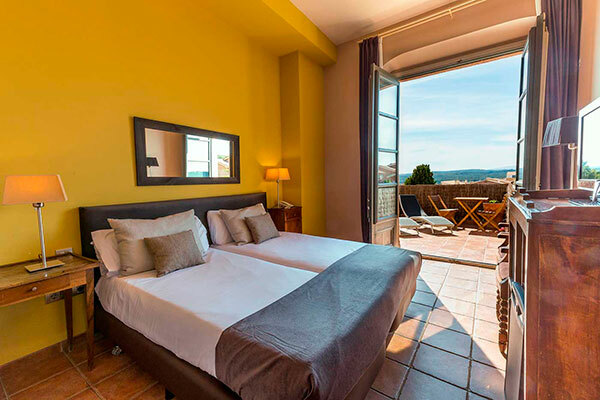 You will also have all of the Costa Dorada at your disposal for all kinds of activities, such as discovering the coast’s coves and inlets, exploring Tarragona city, tasting the gastronomy and the wines, playing golf, cycling and hiking, or enjoying PortAventura World with your whole family. The Hotel Gran Claustre is associated with the Seal of Gastronomic Hotels, Affiliates of the Catalan Tourism Agency. Escape to one of the Costa Dorada’s most romantic hotels. Surprise your partner with our special romantic package. In chef Jaume Drudis’ restaurant Bruixes de Burriac, featured in the Michelin guide, you will find a varied menu with locally-sourced seasonal products, a different menu each month, and a tasting menu. In the Hotel Gran Claustre Spa, you can relax in its intimate and peaceful space. This experience will make your stay unforgettable while you receive various treatments to help you take care of yourself. The Hotel Gran Claustre, located in an historic building from the 18th century, is the perfect hotel for celebrating an intimate, romantic wedding. Celebrate your wedding with us and we will make it the most special day of your lives. 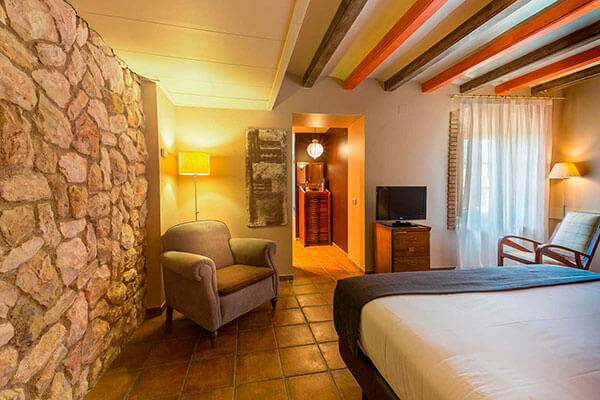 The Hotel Gran Claustre, Restaurant & Spa is one of the best options for enjoying the Costa Dorada, 15km away from the city of Tarragona, a UNESCO World Heritage site. It is a luxury hotel in an enviable location; as well as being close to the beach, it is only ten minutes away from the mountains. This makes this 4-star hotel the best option for a break or holiday – whether it’s alone, in a couple, or as a family. Its location is also perfect for travelling with children as it is not far away from PortAventura, a theme park enjoyable for both parents and childrens. But if you are after a romantic night with your partner, this is the hotel for you too. Its location, along with its restaurant and spa, will make your stay a magical moment of intimacy and tranquility. The hotel is divided over two buildings and has a restaurant, a spa and a swimming pool. All this will enable you to enjoy an unbeatable stay. 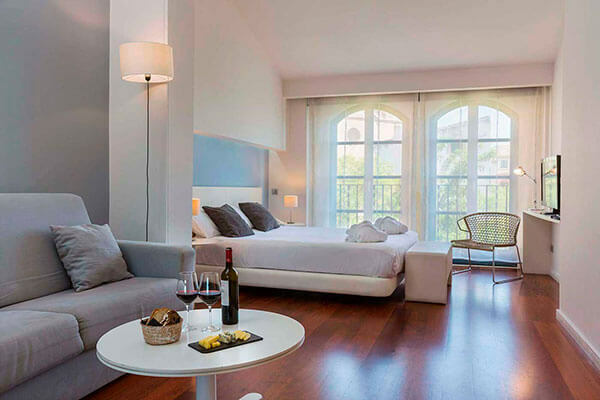 The Hotel Gran Claustre, Restaurant & Spa has 39 different rooms. 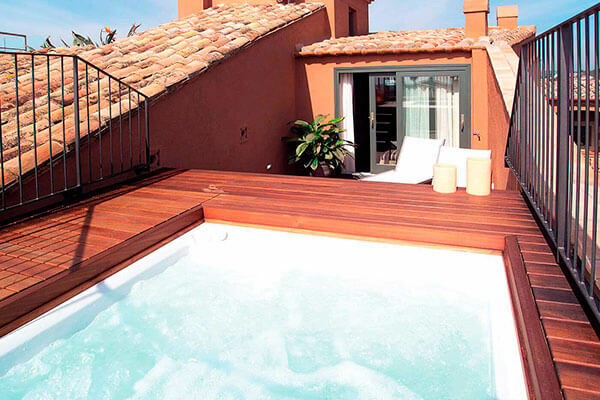 The highlight among them is the Gran Claustre Room, which has a jacuzzi on the terrace: the perfect place to enjoy the comfort of the hotel with incredible views of the surrounding area. In this Altafulla hotel, you will find a Michelin Guide gastronomic restaurant: Bruixes de Burriac by chef Jaume Drudis. This establishment offers a varied selection of locally-sourced products that you can try with the tasting menu. The spa is the most calm and welcoming part of the hotel. The low number of clients per session will make your experience in this Altafulla hotel unforgettable.